USB 3.0 and Blu-ray are next big things and have you ever seen a new product that will be converged with both technologies. 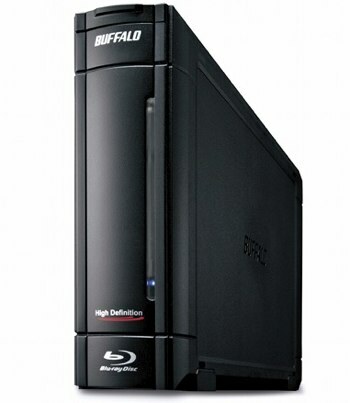 Just recently, Buffalo has unveiled a USB 3.0 compliant Blu-Ray burner targeted for consumer and what is more special here is it can boost up to 12x which is dubbed as the world’s most fastest Blu-Ray player in the market. Named as BR-X1216U3, it could be too advanced for average users as currently the motherboard and chipset that supporting USB 3.0 are still very rare in today’s market and also Intel potentially delayed its chipset development with USB 3.0 till 2011. Meanwhile, there is still no Blu-Ray disc with 12x speed yet. But one thing for sure, there won’t be any bottleneck now since the USB 3.0 interface can be scaled up to 5Gbps theoretically especially when bundled with ultra fast writing speed that can be fitted well for future system without the need of upgrade. Good thing is, it is fully backward compatible with USB 2.0 host port even though the maximum writing speed has to be trapped at 7x, which is still far more sufficient for current demand. Targeted for official launching by next month, the Buffalo burner will be retailed at $460 and it is compatible to run with Windows Operating Systems such as XP, Vista and even Windows 7.